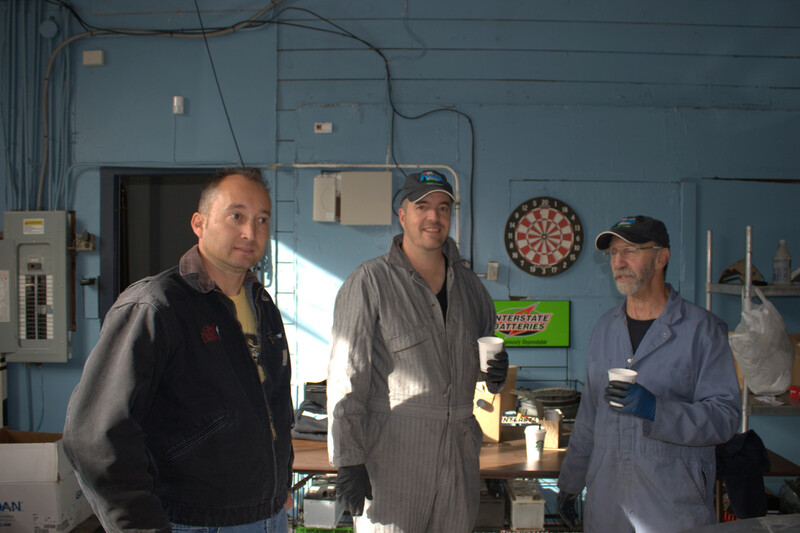 Saturday, October 25th 2014 will go down in history as the first BMW CCA Oregon Chapter DIY. Okay, not as big a deal as landing on the moon, but a remarkably good time for the Chapter members who participated. 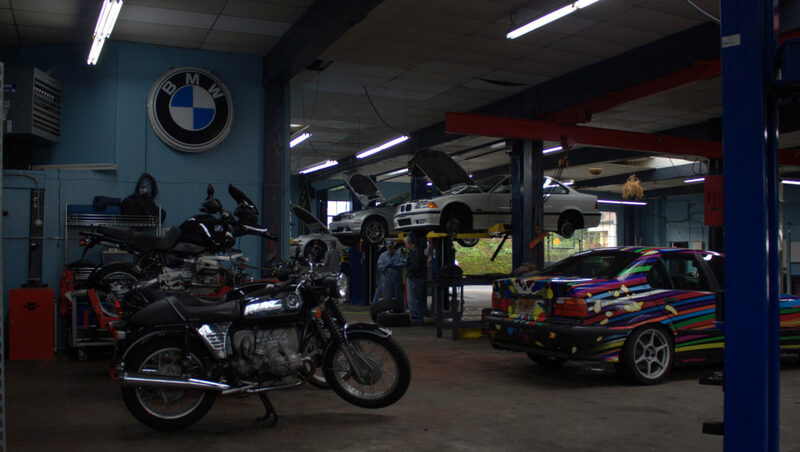 Munich Motors owner Joseph Gilmore was the host for our first “DIY your BMW.” When driving into his turn-of-the-century building (that’s the 20th century, mind you) you are immediately aware of the history this building has had for almost a hundred years of auto repair. 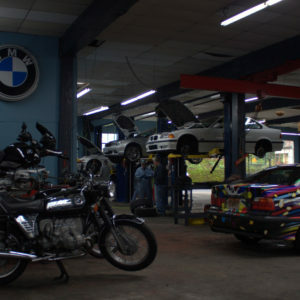 DIY your BMW is a new event this year, and we hope to see enough interest from our members to do it again. 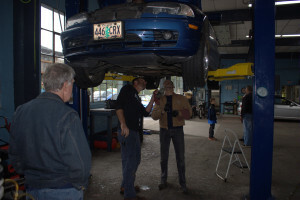 For a $25 donation to our Chapter, you will get time on an automobile lift to work on your car while having the supervision and guidance of a professional mechanic to walk you through the tasks needed. Lunch is provided by the club. We planned for a maximum of twelve cars with a limit of 90 minutes per car on the lift, or “rack.” We ended up with six cars in attendance, which fortunately gave all of us extra time when needed. I was the first that needed more time, as the delivery of the part I had ordered was delayed by about two hours. The good news was that Munich Motors has enough lifts to accommodate a total of 3 DIYs simultaneously while still tending to the regular customers they had that morning. Guibo is also known as the Flex Disc. Between the transmission output shaft and the driveshaft, there is a flexible coupler that joins the two together. This rubber, reinforced coupler (guibo) isolates vibration from the rest of the drivetrain, while transferring power from the engine and transmission to the rear differential and wheels. Joseph set me up and told me what I needed to do. Jeff Drilling was next to me, working on his 2004 330Ci to change its automatic transmission fluid. Unlike a standard transmission, this one takes a lot longer to do and had much more detail to the work. This resulted in yet another car exceeding the 90 minute time limit. Buck Bailey was next up to change the brake pads on his 2005 645Cic. This became a group project as we all had something to say about what to do next. Lots of fun, and this one may have stayed within the 90 minute limit. Of course we only did the front brakes so a full brake job would have run us longer. After all, we are amateurs. 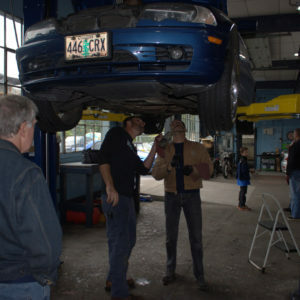 When Buck’s car came down, Dave Kaechele’s 2003 325IC went up on the rack to change fluids in the transmission, clutch, and differential. Dave clearly knew what he was doing as he was on and off in less than 60 minutes. When Jeff was done, Alex Casey grabbed the lift to do an Inspection 1 and 2 on his 2004 330Ci ZHP… and an inspection is what he got! Joseph took a good amount of time going through his car top to bottom and pointed to a few things for Alex to set his sights on and fix in the future. Last but not least was Trayson Harmon with his awesome looking 1998 E36 M3 Cabriolet. Trayson’s list was long but I think his focus was on changing the fuel pressure regulator to a Dinan version. All seemed to go well until he started it back up and fuel came squirting out. It turned out to be a missing clip that was suspiciously absent when he purchased the unit from a friend. Quick thinking Joseph retrofitted the old clip, and Trayson was back in business. Having Joseph there was like being back in High School shop class and having your teacher at hand to watch you and come to your rescue when needed, which was often the case for most of us. 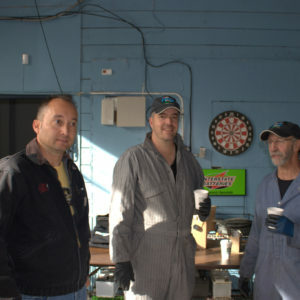 We also had his other mechanic, Chris, who assisted in many projects. Thanks to David Hows and Janette Teevan who were busy snapping photos to capture and document the day. This was a great day, with serious fun. When can we do it again? How many can we handle when 90 minutes seems to just fly by?